For fans, one of the big selling points of sports is the unpredictability. In any given game, on any given day, something remarkable could unfold right before our eyes, in real time. The appeal of sports documentaries then is the how and the why, not the what. We already know who won; now we’re looking for some insiders’ insight. Sometimes, though, a sports-doc comes along where the outcome is less well-known, at least to people who aren’t already familiar with the subject. Those movies, when done right, combine the best of two worlds. They’re suspenseful and revealing. Louise Osmond’s Dark Horse is done very right. Using a mix of archival footage, new interviews, and thrillingly cinematic recreations, Osmond tells the story of Dream Alliance, a thoroughbred horse who captured the imagination of U.K. racing fans in the late ’00s. The animal didn’t have the pedigree of a lot of his competition. He was sired by a fairly obscure mid-’90s American champion named Bien Bien and a testy mare named Rewbell. And the most unusual biographical detail about Dream Alliance was his owner—or, rather, owners. 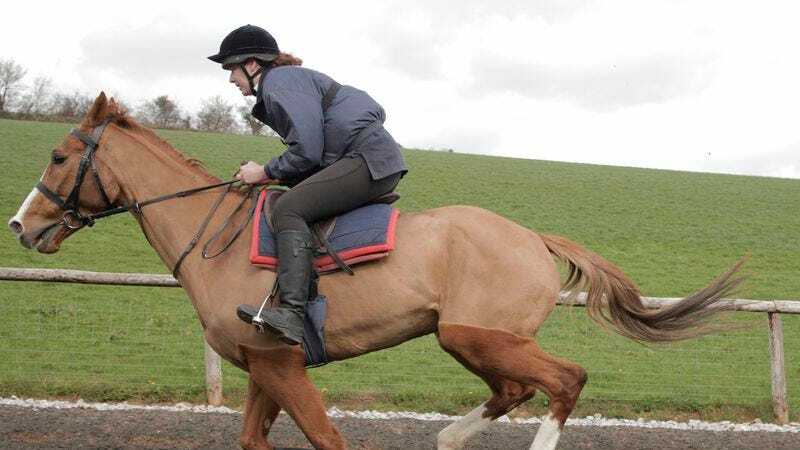 Welsh barmaid Janet Vokes, in between shifts at a Cefn Fforest pub and her second job at a local supermarket, convinced her friends and customers that if enough of them pitched in £10 a week, they could afford a racehorse’s exorbitant training fees. That’s how a group of folks from an economically depressed former coal-mining community crashed into the owners’ boxes at some of the region’s most prestigious steeplechases. That alone would make a great story, and Osmond doesn’t shortchange the parts of Dark Horse that are just about working class and unemployed people commanding the respect of the landed gentry. When Dream Alliance started to have some success, the media was first drawn to all the odd details of his upbringing—including the scraggly patch of land in Caerphilly where he wobbled through his first year of life, before being sent off to a proper trainer. That, in turn, led to items about what had happened to the old coal towns when the industry shut down, and inquiries into how the people who lived there were getting by. But there was more to the class divide aspect of the Dream Alliance saga than just some ’80s-style “slobs vs. snobs” comedy (with toothless schlubs ultimately winning the aristocrats over with enthusiasm and humor). When the wear-and-tear of the racing season began to take its toll on the horse’s health, the Cefn Fforest syndicate faced choices that no wealthy owner ever would have to consider, like whether to divide up their meager (but much-needed) winnings or to funnel them back into costly, risky medical procedures. Again, for anyone who already knows all about Dream Alliance, Dark Horse will be valuable mainly as a behind-the-scenes look at an improbable Grand National contender, with his colorful, funny owners explaining how they made it all happen. Vokes and her colleagues took a hands-on approach to breeding and raising their horse, sweating out every stage of the process, where so much could’ve gone wrong. At first they cared deeply because they had money they couldn’t afford to lose on the line. But quickly Dream Alliance became part of their family, and a source of local pride. Meanwhile, for the many, many viewers who’ve never heard of Dream Alliance, Osmond’s documentary is edge-of-the-seat stuff. She doesn’t do anything radical with the film’s form—it’s just a straightforward sports-doc—but her team’s skillful editing makes every turn and jump on the track into a moment of high drama. 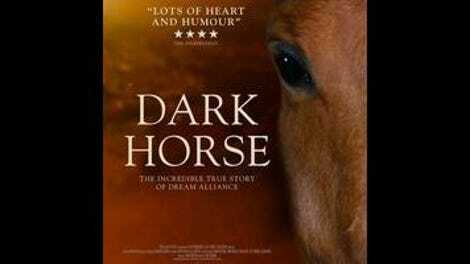 Dark Horse is well-paced, sometimes galloping ahead full-steam and sometimes slowing to a reflective lope. But it’s always focused on the most compelling part of the Dream Alliance story: how a group of neighbors who’d been through plenty of hard times were uniquely built to weather any bad turns of fortune, and to enjoy their wins to the fullest.